Lol. I can’t decide if I love that dress or hate it. I’d love to make a houndstooth quilt but the dress is too bold of a choice for me. Come to think of it, I had those white boots, too. Am sitting here at the auto repair shop. My car has a coolant leak and the poor thing started smoking 1 mile from here. That was one long mile! I’ll be here for the foreseeable future I suppose. https://www.shabbyfabrics.com/Clover...er-P52324.aspx. Anyone have one of these, sure looks interesting for making pillows etc. I'm in the Sooner group, but just went on YouTube to hear this. I've never heard it before, but what a cute song! Now I have it stuck in my head! Oh I wish there was music like this on the radio nowadays! I agree with you! Music back then was my favorite. The lyrics made sense and you could actually hear the words! Mailed off my F8s this morning and emailed my tracking number to Janice. I am so ready. I'm in both groups, so I plan to make my Sooner blocks first since they're due in 2 months. I will be watching what everyone is doing over here so I don't repeat a block already done by someone. It occasionally happens but with different fabrics it looks different anyway. My advice for all the new ladies....just relax and have fun with it. If a cutting mistake is made, speak up. We help each other out as needed. And that's why I'm still stuck in the 70's music-wise! I'm in the sooner boom. Terriamn I kind of had the same thing happen to me except that I came home (through the garage doors) turned off my security alarm and smelt gas in the house. I called the hot line and they came out. They said I was lucky that my house didn't explode from the heater kicking on as I was opening the garage doors, turning on the lights and turning off the security system. Come to find out one of my dogs stood up at the counter next to the stove and accidently pushed in on of the knobs and turned it as they were getting down. From that day on, my poor fur babies are locked in the laundry room when I'm not home. Queenbarbie for sure you were lucky. My garage isn’t attached so I was able to use the opener and move car around front. This past few days has been dramatic here in Okie land too. We have a good friend vacationing in Mexico City. He has been posting all kinds of fun pics. He posted he was on the roof of the apt (air b and b) for the eclipse, then nothing after that until about 5 pm and there was a post about him being robbed and drugged and then nothing. The post said he had to go to the local apple store just to make that post. Nothing about the post seemed like him at all. The wording and way it was written just seemed off. NO ONE had heard from him, not his local (in Mexico City) family or State side family or even his best friend. Air b and b was trying to locate the apt owner to find out if he was okay. Anyway a very tense 1.5 days and have found out this afternoon he is infact okay. He was drugged and robbed and the post was real, but he is okay and on the way home!!!!! My father is in the hospital, just found that out a couple of hours ago, they are doing all kinds of tests. Don't know what it going to become of that yet. Tomorrow I have to take Gary for an out patient procedure. (nothing dangerous) So not sure when I am going to get to make the 80 mile drive to check on my father. I just couldn't today I was way too tired from the long night of worrying about our friend in Mexico City. Kass, so glad to read that your friend has been found and is on his way back home. Can't even begin to imagine the ordeal he has been through the past couple of days. Hope everything will be fine with Gary and your father, positive thoughts coming your way for both of them. Terri, that would have scared the bejeebers out of me! I am so glad the situation was not as awful as it certainly could have been. Somebody up there is looking out for you. Wow! Some really close calls. I’m glad everyone is ok.
Time to get the bubblesuits out for you and loved ones. Not sure about the cars and homes. It is very hard to keep calm whenever things are out of our control. Quick thinking Terri. Kass, take care of your self , don't want you down again. Terriamn, I'm so glad nothing serious happened. How frightening! Do the gas folks think it had anything to do with the very cold weather? So happy you all are ok.
Queenbarbiej, you had some serious luck on your side for that considering nothing triggered an explosion. And I can absolutely see how a dog could do that, although truthfully, I never considered the possibility until you wrote it. Happily, both my dogs aren't jumpers, but you never know. Oh, Kassaundra, how upsetting! I'm glad your friend came out of his ordeal as well as he did. We seem to be hearing about a lot of people who go missing lately in other countries. (DH and sons were in Peru last summer and they were completely out of touch for a week. We knew they would be but it was a little unsettling anyway.) I hope you can soon see your father and that the doctors discover what's happening with him very soon. And Gary, too? My goodness, best wishes for a swift recovery. My, you have your hands full. Hugs. TG is right. Bubble suit time for all Boomers and family and friends. Here is the fabric I chose for the later group. 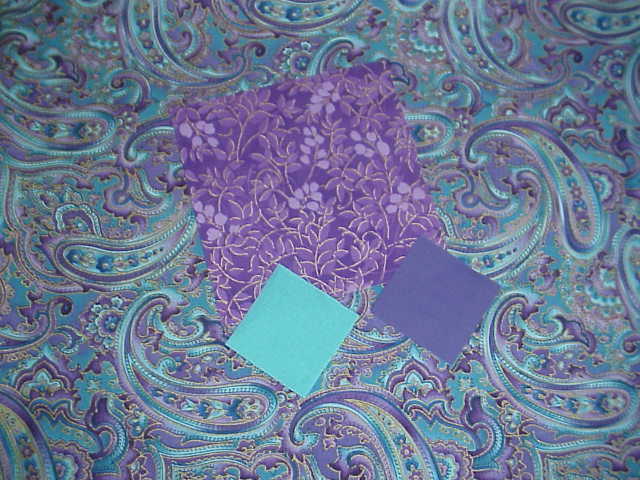 I will be including a 5" multi purple piece of fabric and a aqua and purple swatch to show matching colors in the fabric. Any tone on tone of these colors will be great, the 5" fabric I would like to see in the block if possible but not required. I am thinking white or WOW for a background color. Beautiful fabric and colors. What are the names of the solid colors? They are both Kona fabrics, I don't recall the names. The lady at the quilt store read the name of the aqua color and I all I can remember is it was something tropical sounding. They gave my father a 100,000 mile check up. Refilled some fluids, got his sugar levels back down, gave him some iv antibiotics and are releasing him today. He was dehydrated, hyperglycemic (over 600), had a raging intestinal infection, and his gi meds for a chronic issue were not working effectively so he is to follow up w/ his dr for different gi meds. Our friend is now back on Okie soil. Squishy is in the mail. All's well that ends well, in Okie land today. Geez Kass, what a 24hrs you have been through! Hope everyone is feeling much better today. Why can't things just happen in dribs and drabs instead of everything happening at once?